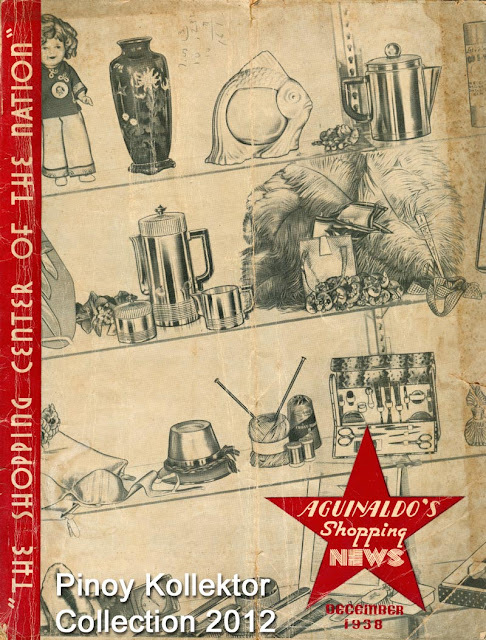 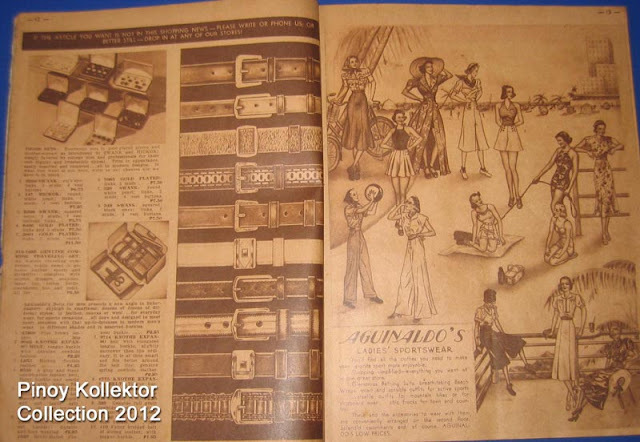 Before the SM Super Mall era, the Aguinaldo Department Store was the biggest shopping store in Manila in the 1930s. 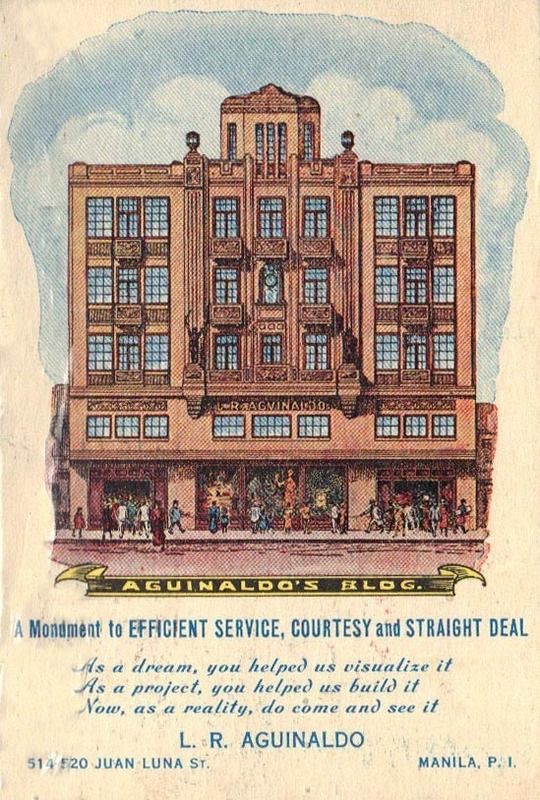 The Aguinaldo Department Store was located in Juan Luna Street. 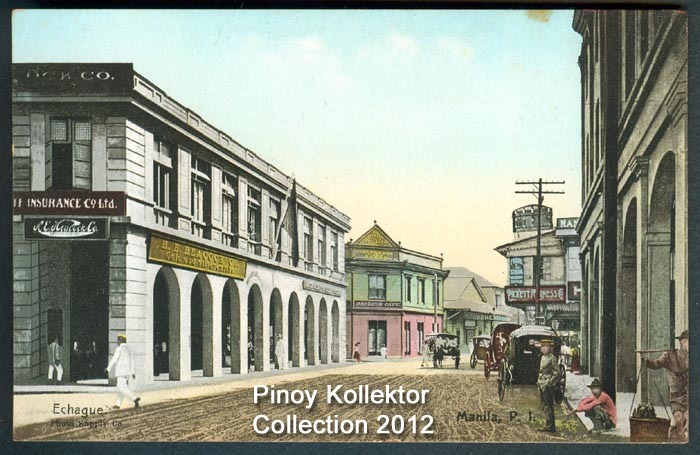 The building it occupied exists to this day as the Marvel Corporation Building with its distinct Katipunero and Liberty statues. 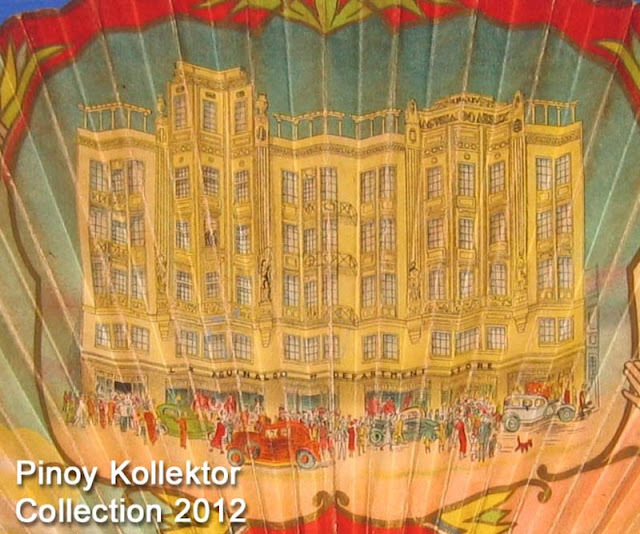 Owned by Leopoldo R. Aguinaldo & Co. Inc., the store was one of the more posh department stores in Manila. The company started on July 4, 1921 and by 1925, it opened a New York buying office. 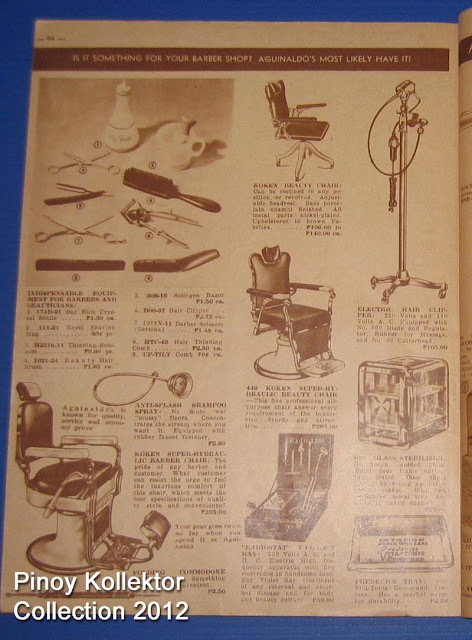 In 1931, the company inaugurated the Aguinaldo Institute of Hair Science, which included make-up and beauty culture curricula. 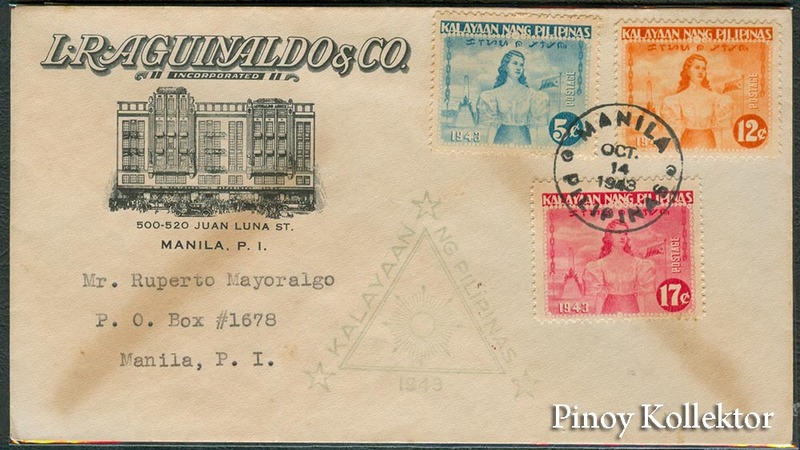 The same year it inaugurated a six-storey department store at Juan Luna Street. 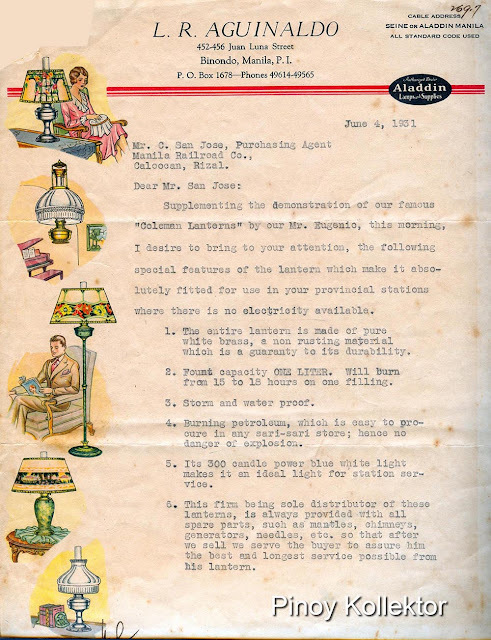 The Aguinaldo Department Store sold footwear supplies,women's accessories, dress trimmings, men's furnishings, household furnishings, Coleman lamps, toys, novelties, giftware and hair waving machines. 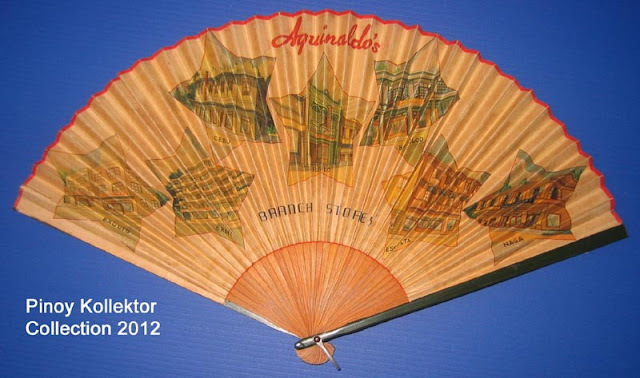 In 1938, it added branches in Dagupan, Baguio and Ermita. 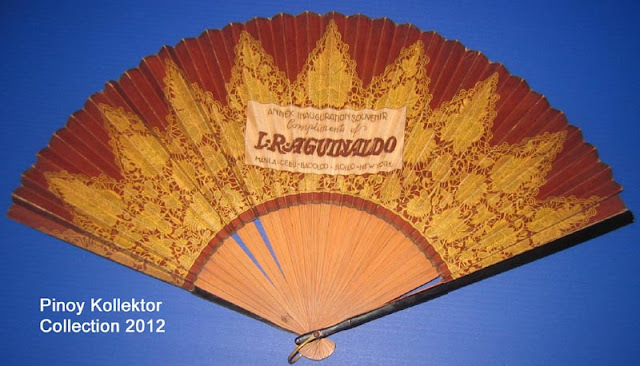 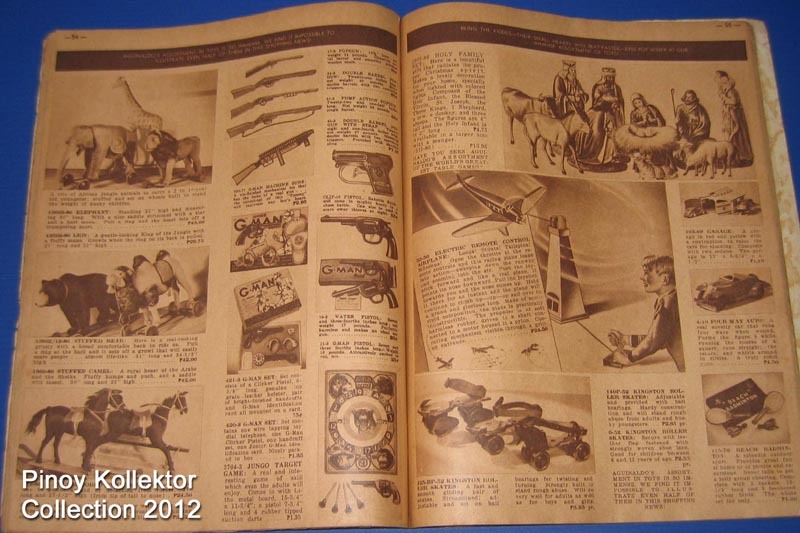 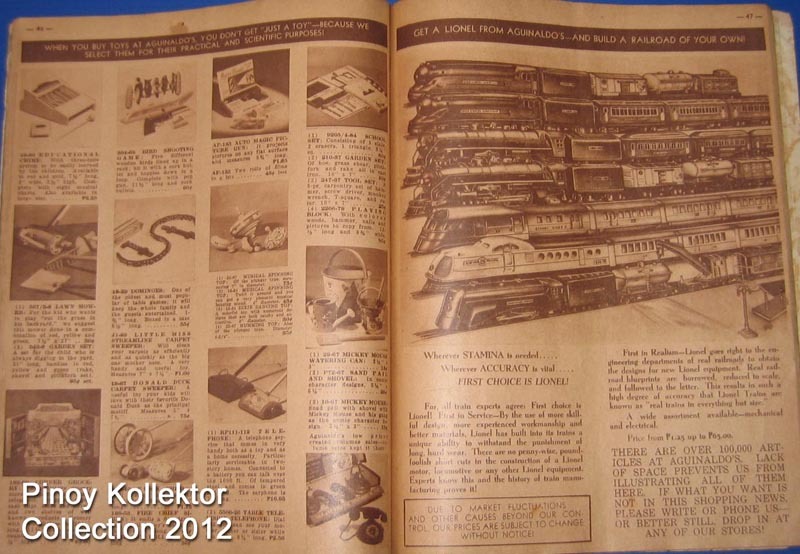 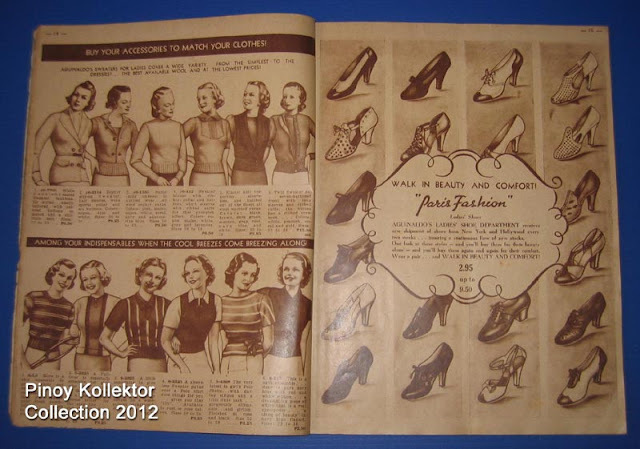 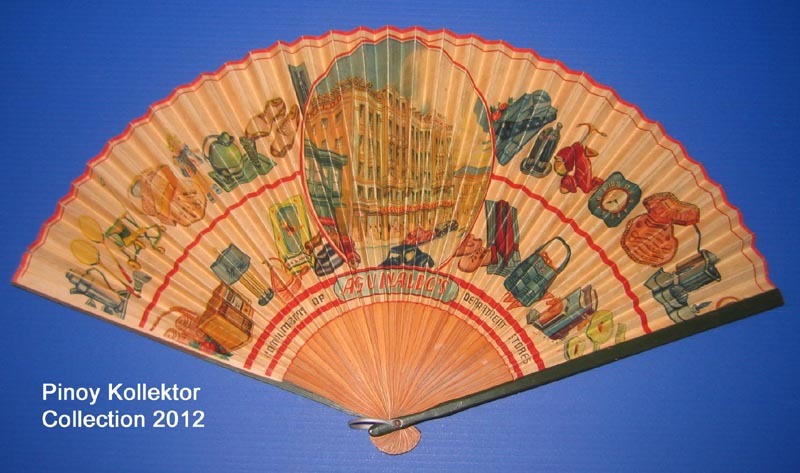 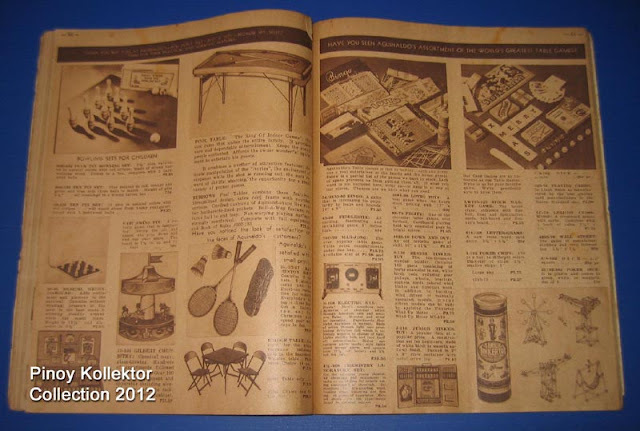 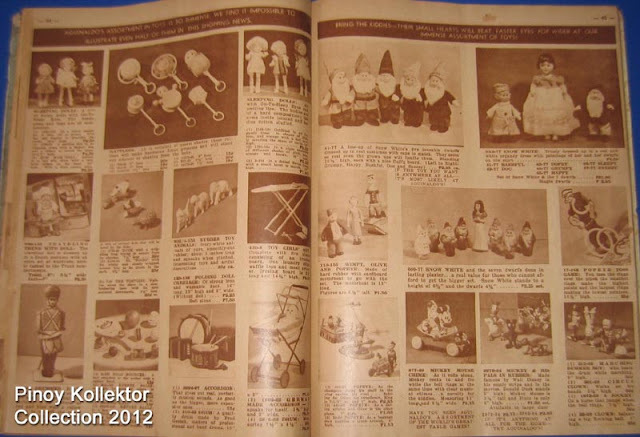 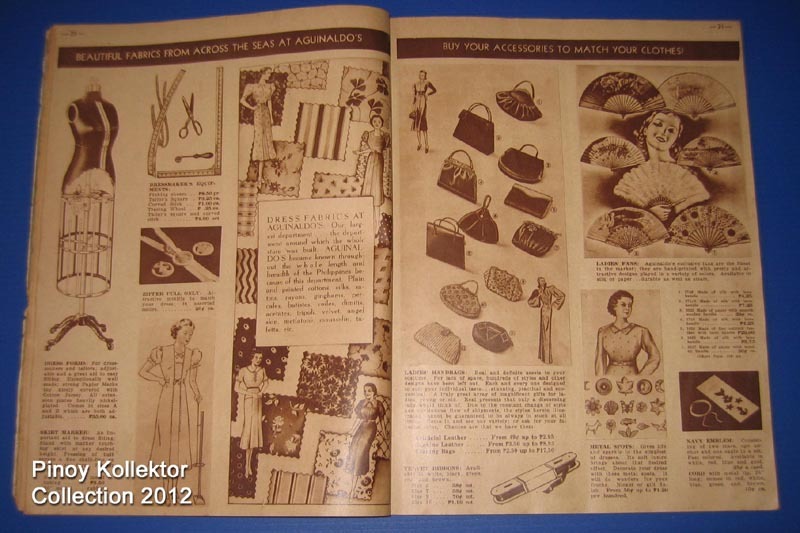 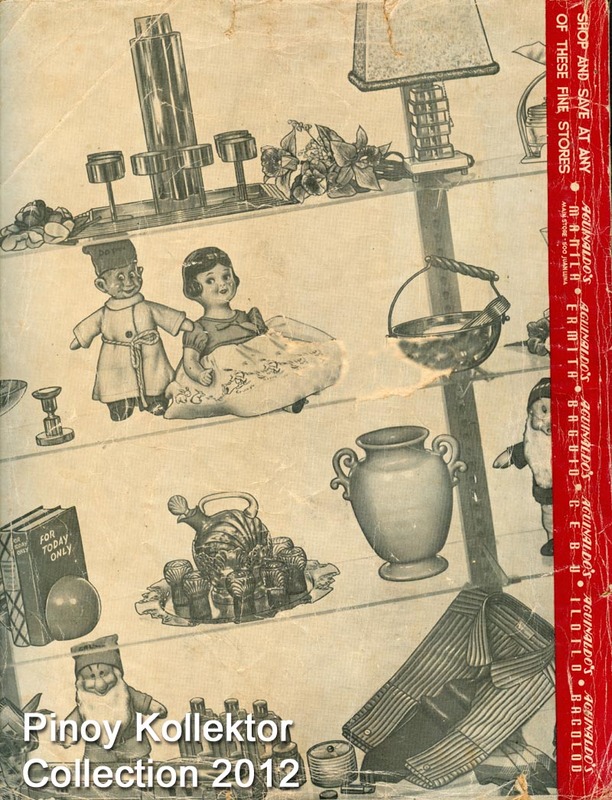 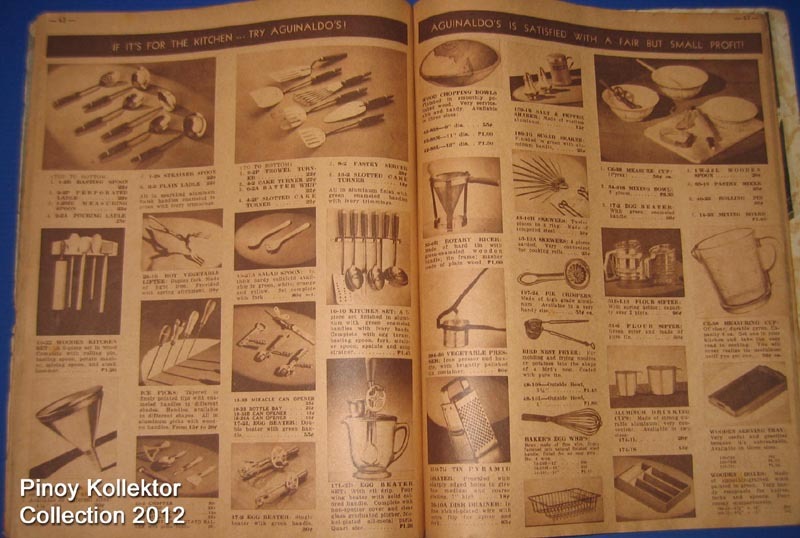 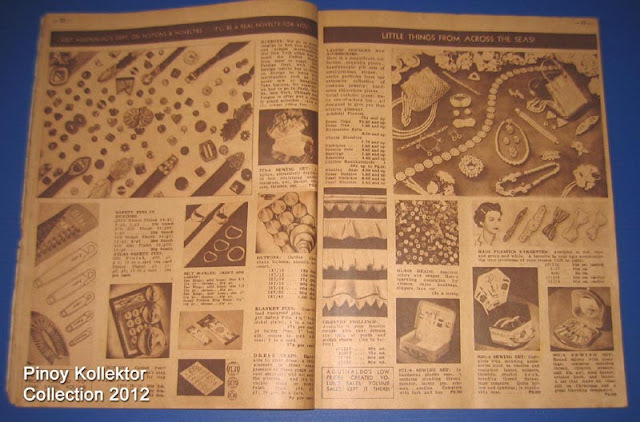 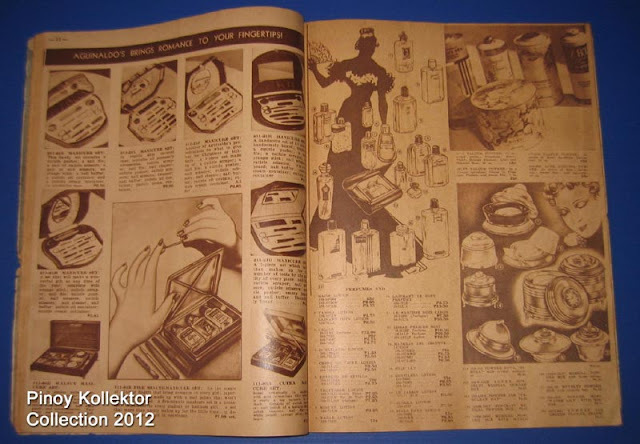 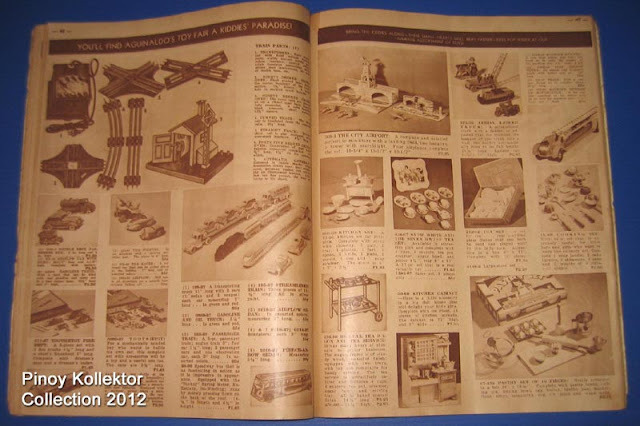 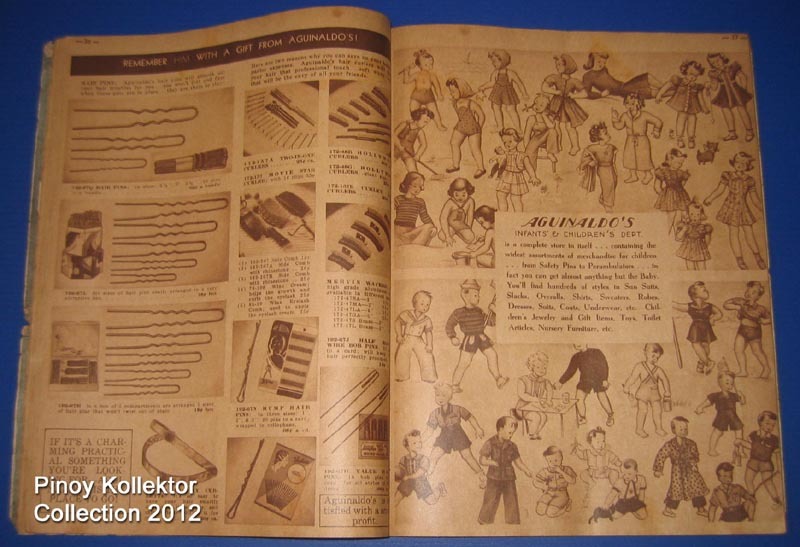 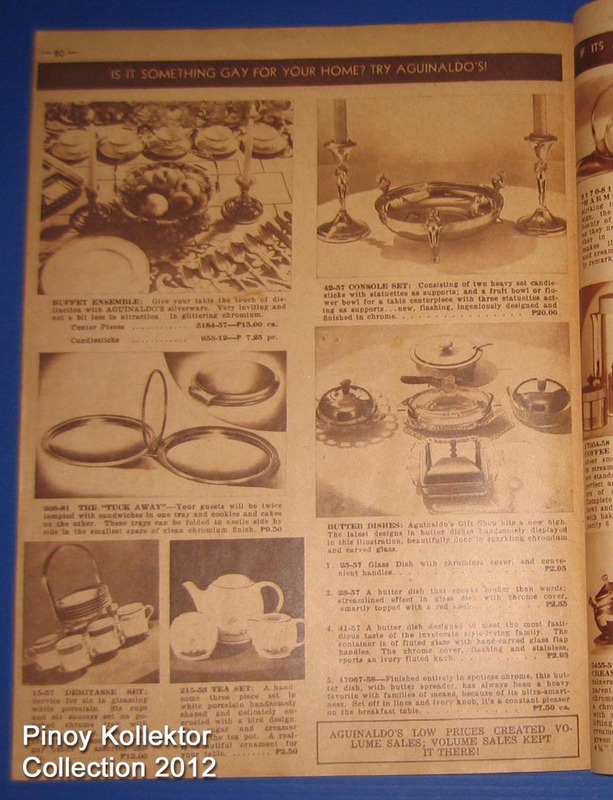 I was able to preserve some souvenir fans and a 1938 shopping catalogue which I would like to share. 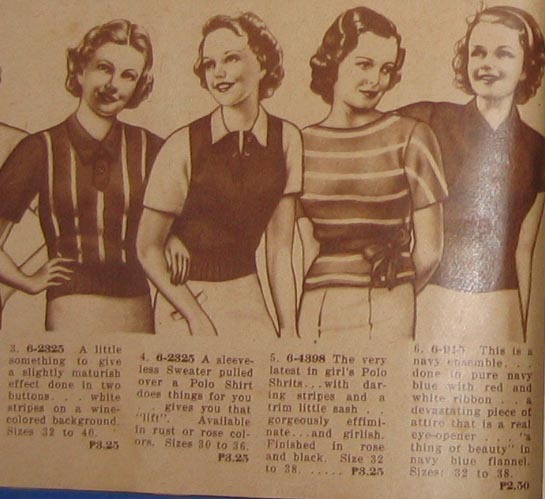 Shirts were very cheap back then. 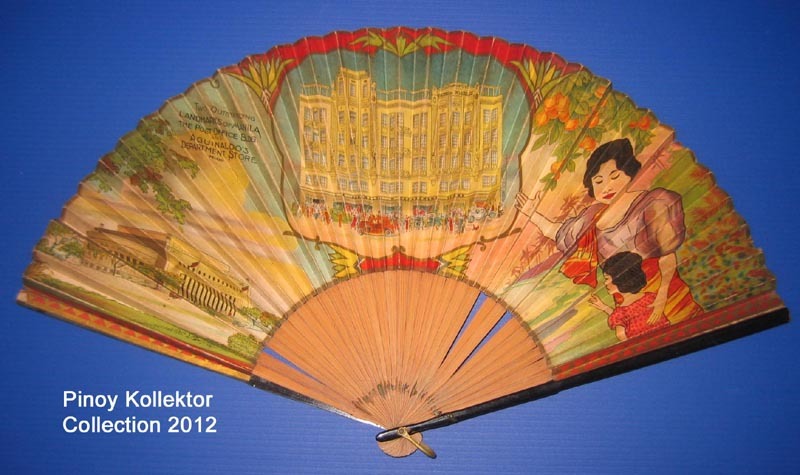 I like to collect photos and memorabilia of buildings in the old Escolta, Manila. 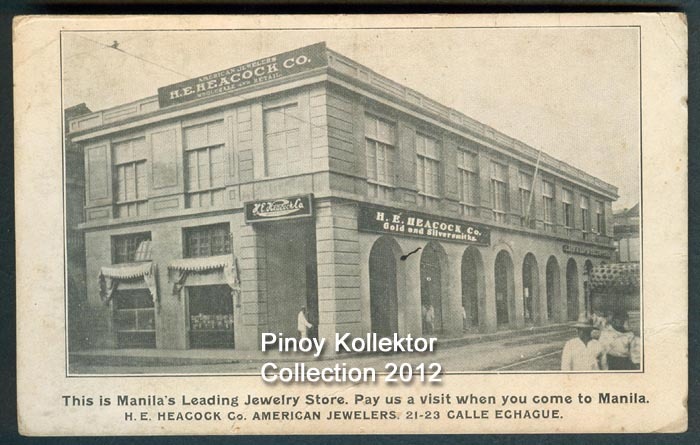 One of the forgotten structure was Heacock's Building, a department store in Escolta. Pre-war pin of H.E. 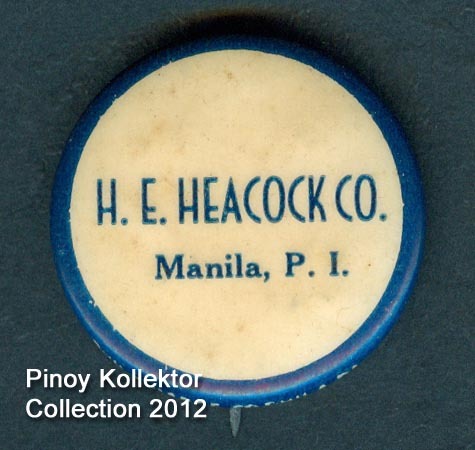 Heacock Co. 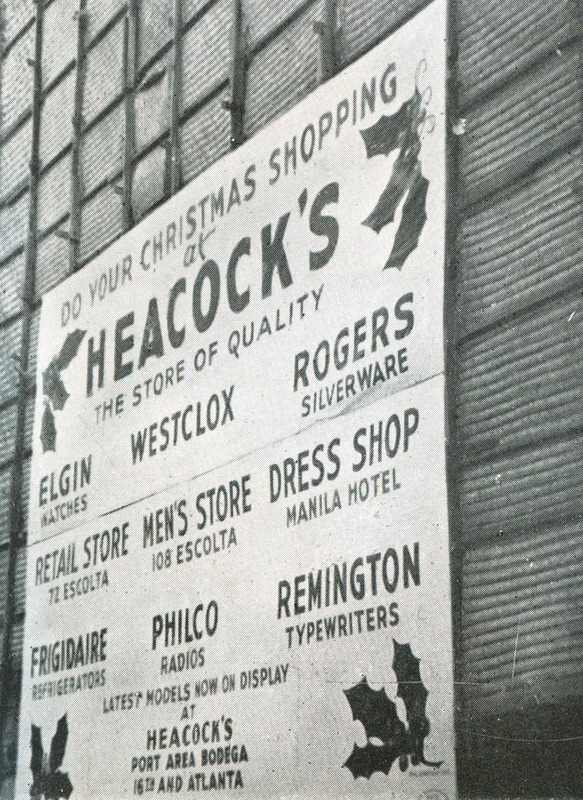 The Heacock's Department store, considered during the prewar years as the largest in the Philippines, began in 1900 when H.E. Heacock and B.W. 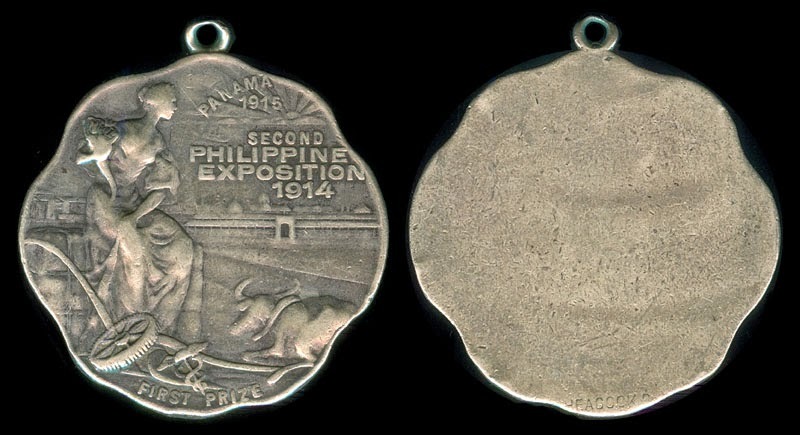 Freer opened a jewelry store in Manila at the old McCullough Building near the Santa Cruz Bridge. It dealt with retail and wholesale trade of Elgin watches, International Silver, Rogers Flatware, Gorham's Silverware and other lines of jewelry and silverware manufactured in the United States. They moved to the new Lack and Davis Building in Echague street, Quiapo, and in 1909 they moved again to Escolta in an old Spanish period building between Pinpin Street and David Street. 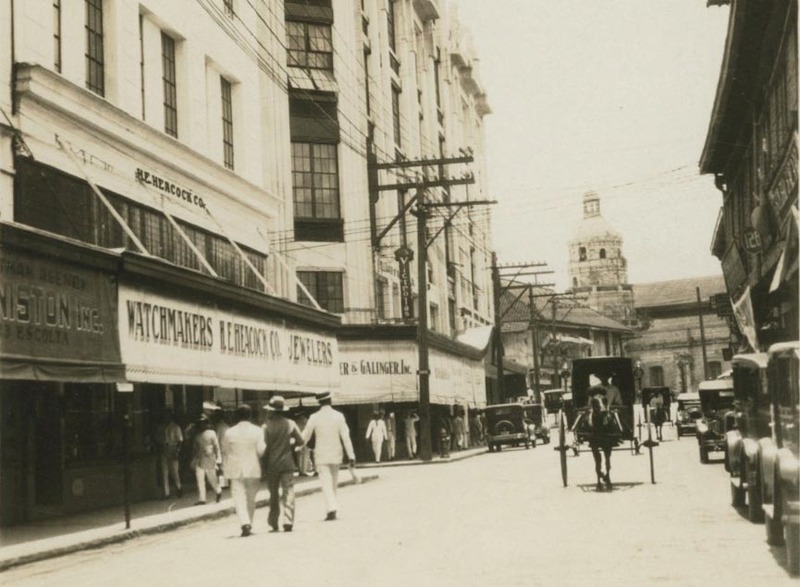 In refurbishing the building, they put up the first glass sheet front facade ever put up in Manila. In 1910, Samuel F. Gaches was treasurer of a Philippine corporation which took over all assets of Heacock & Freer. 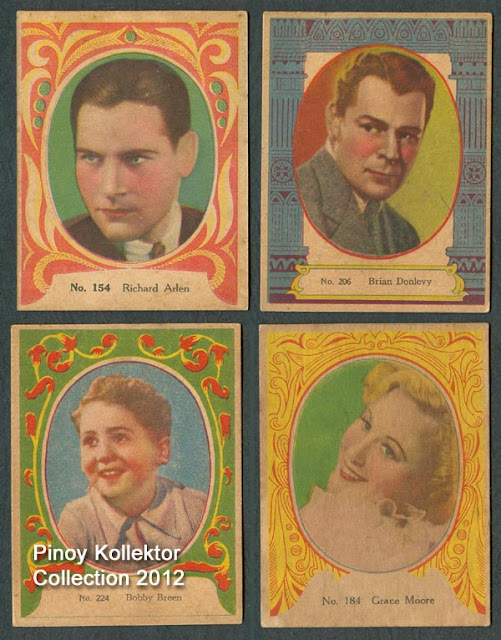 They obtained permission from Dr. Burke to put up a four-storey building at David corner Escolta Streets. 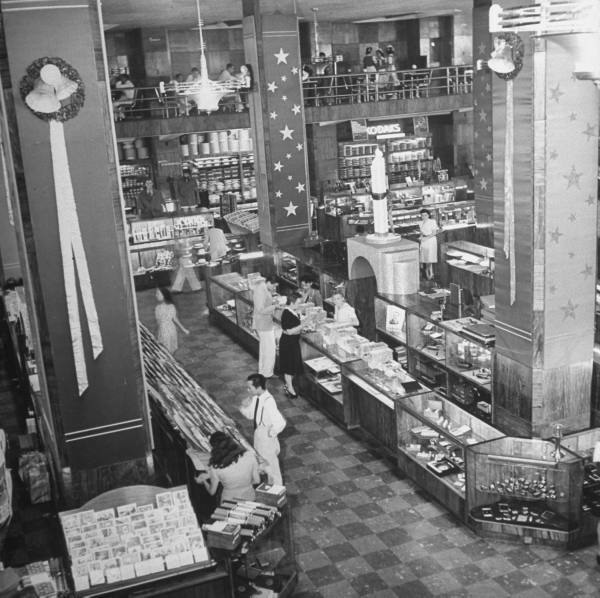 It was then considered to be very modern and comparable to American department stores of the time. 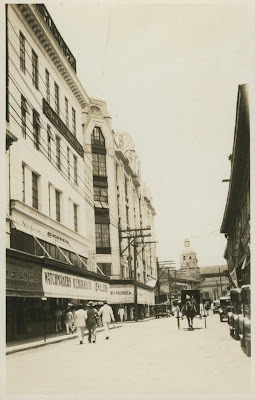 In 1919, they put up a seven- story building on the southeast corner of Escolta and David. At the same time, they opened branches in Iloilo, Cebu, Davao and Baguio. 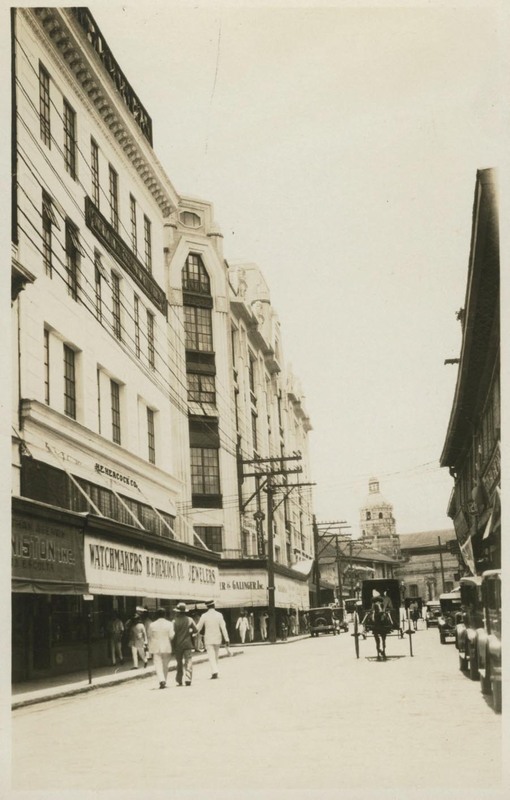 The seven- story building was destroyed by an earthquake in 1937 but was rebuilt in 1938. In 1938, Heacock's was envisioned to be one of Manila's more trendy department stores with its streamline Art Deco design. 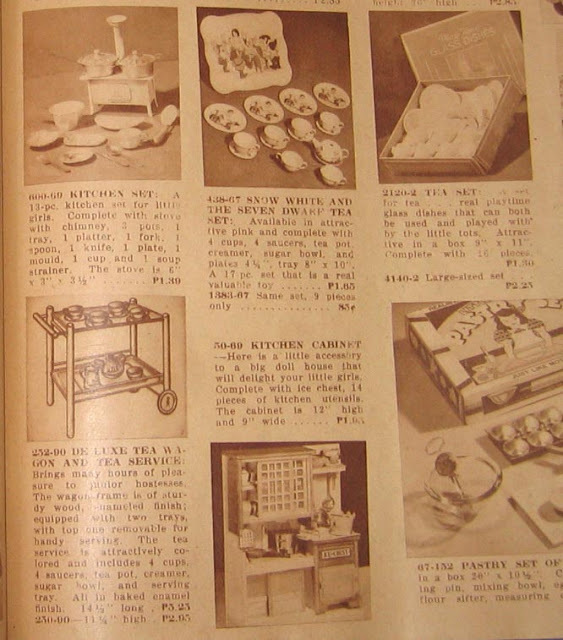 Some of the American manufacturers whose products were sold at Heacock's were: Federal Cash Register Co,; General Motors, Frigidaire Division; International Silver Co.; Remington Rand Ine. 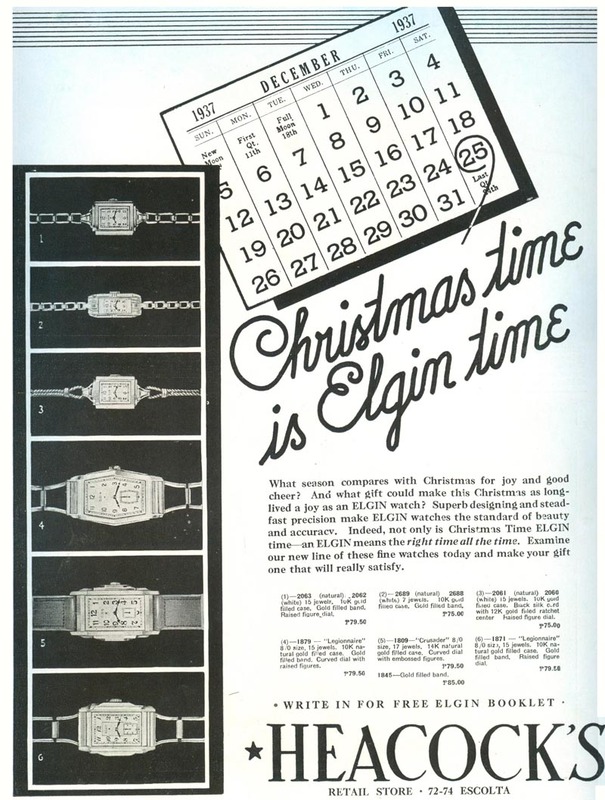 ; Typewriter Division; American Steel Export Co.; and Elgin Watch Co. 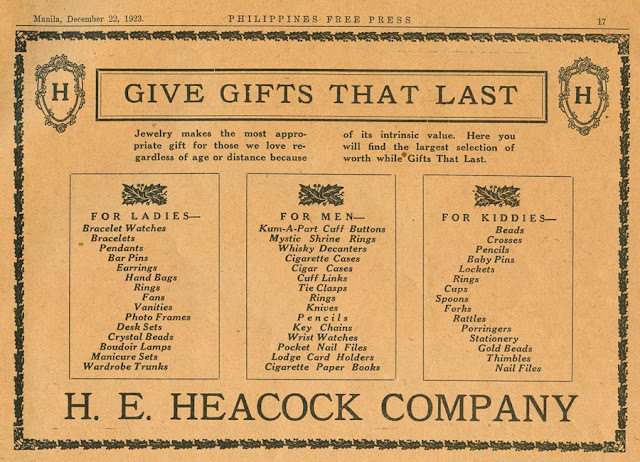 It was largely due to Samuel F. Gaches that Heacock's flourished to be the leading department store during the prewar years. 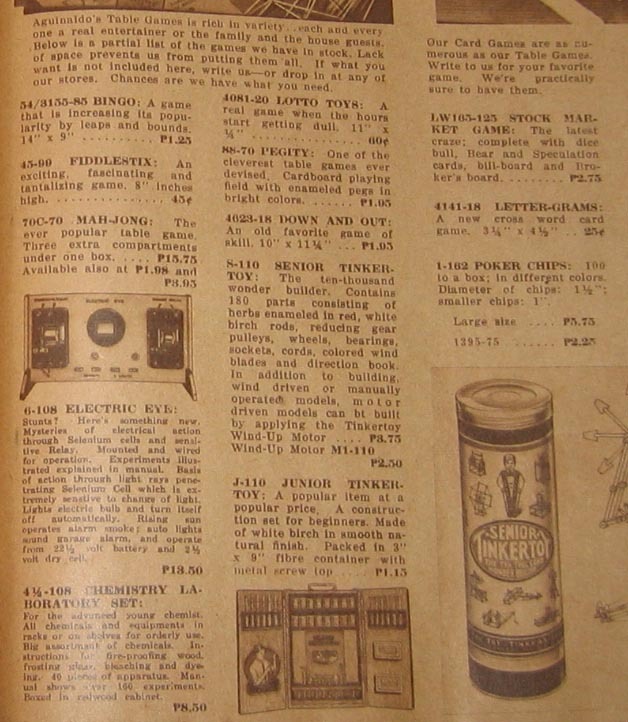 He would become president and general manager of the company. 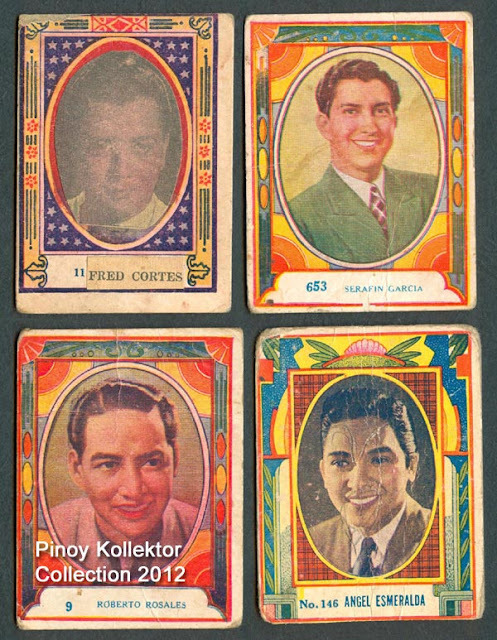 Gaches was also vice-president of the Philippine American Drug Company. 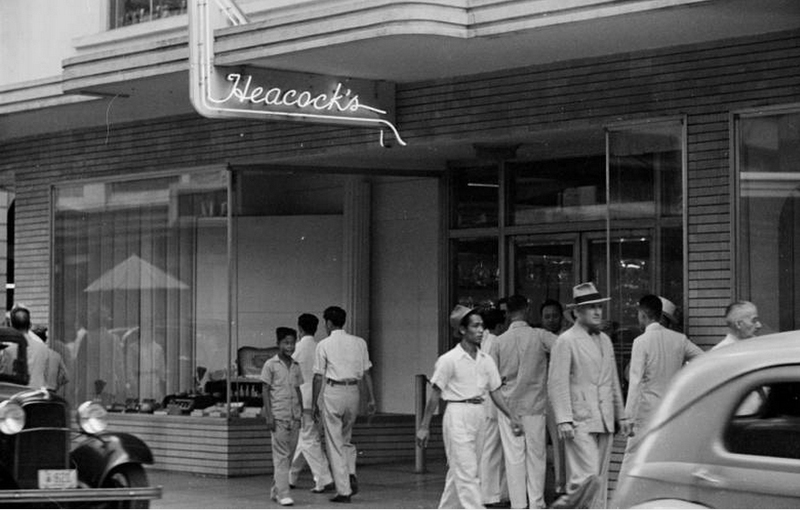 H.E Heacock building on left. 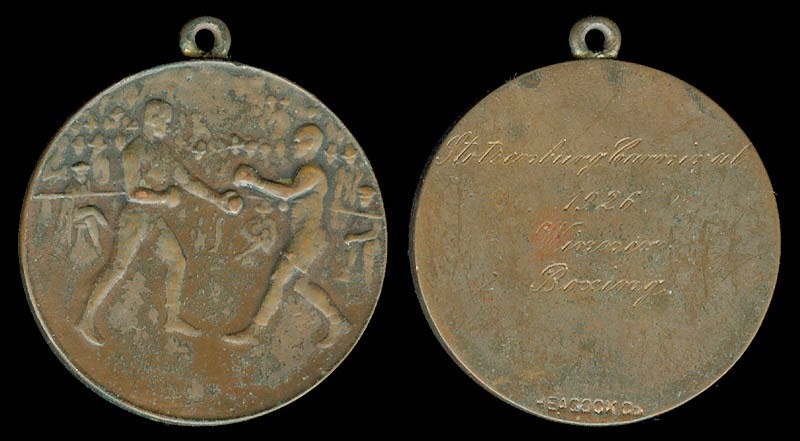 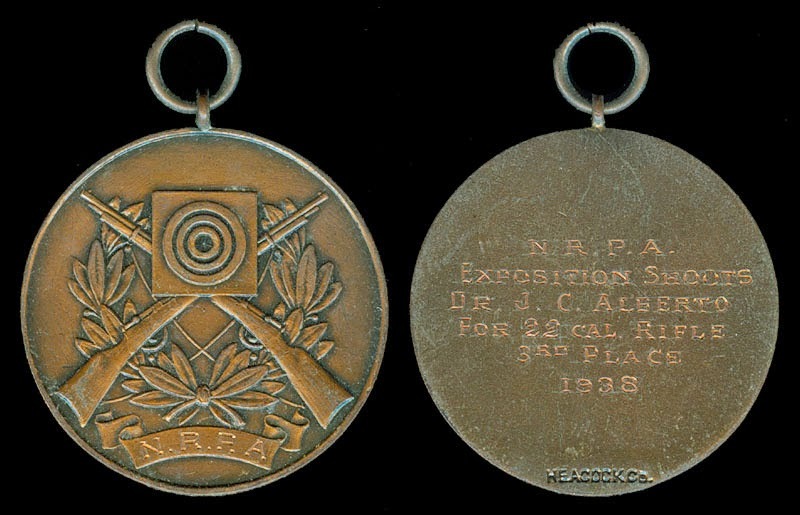 Shooting medal / badge made by H.E Heacock Co. 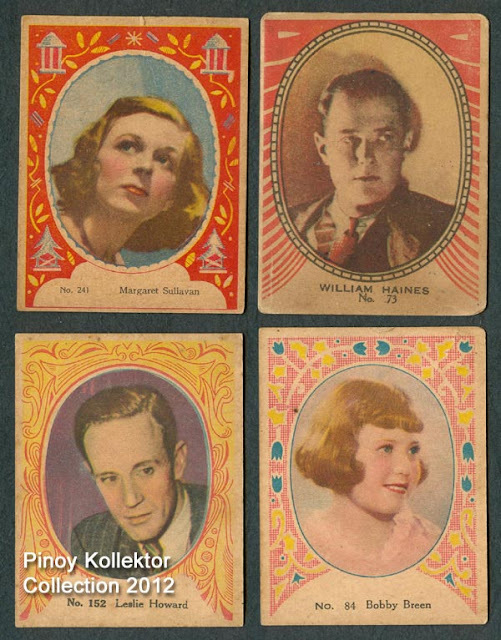 These “TEKS” cards were printed during the late 1930s. 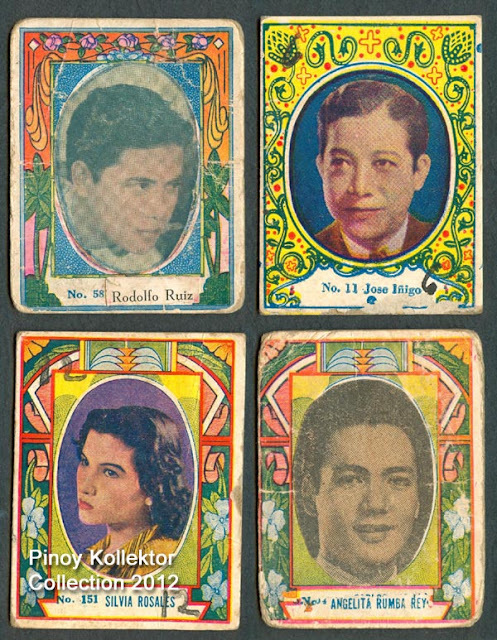 My dad who is 81 years old now, remembers playing with these cards. 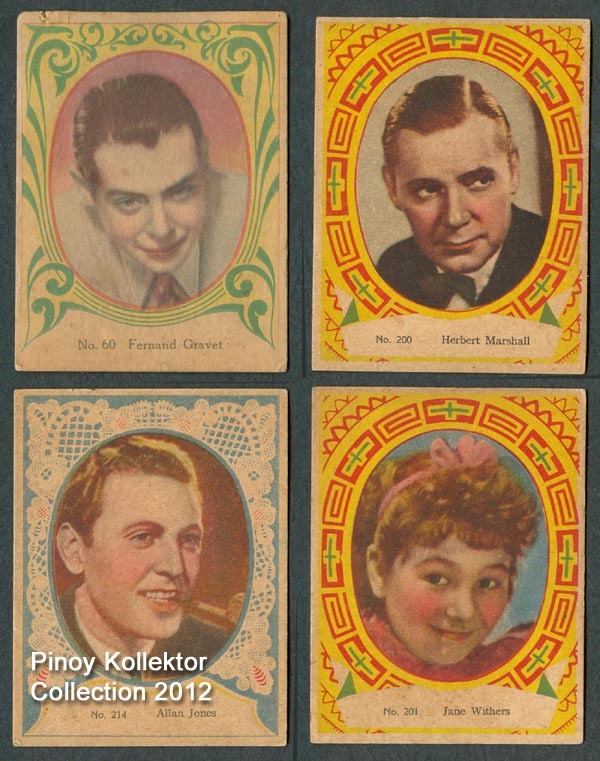 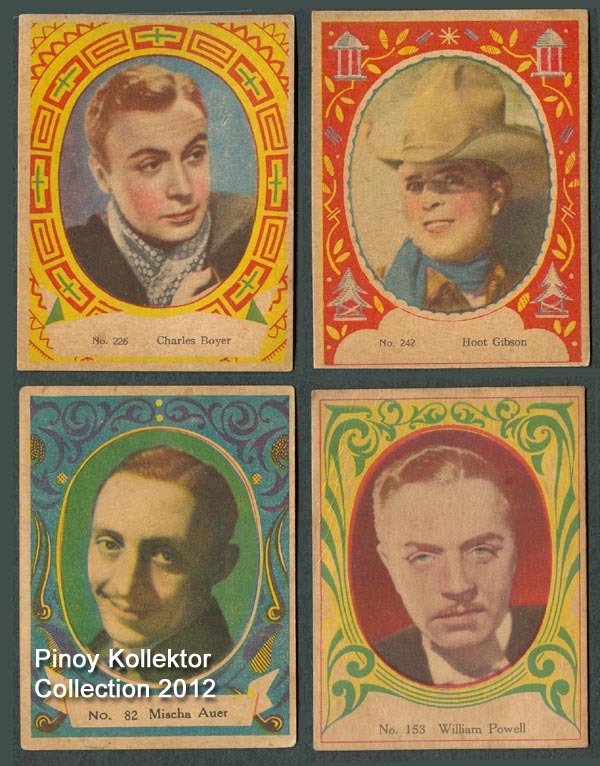 The cards featured pre-war Filipino movie actors and actresses. 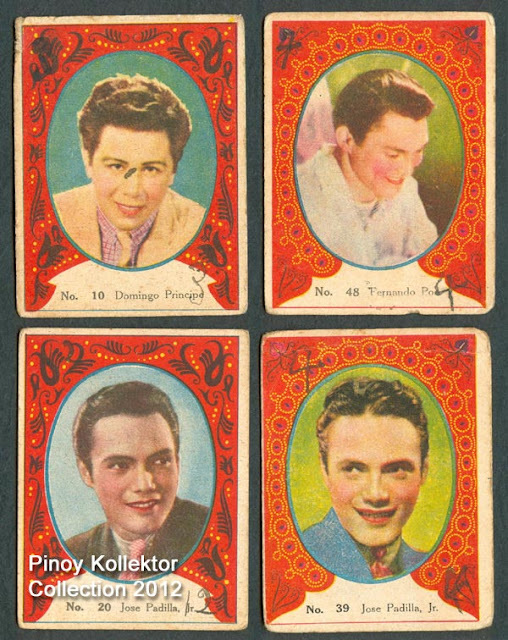 The 1930s was known as the Peace Time Cinema reflecting the Filipino character of being a happy and gay people. 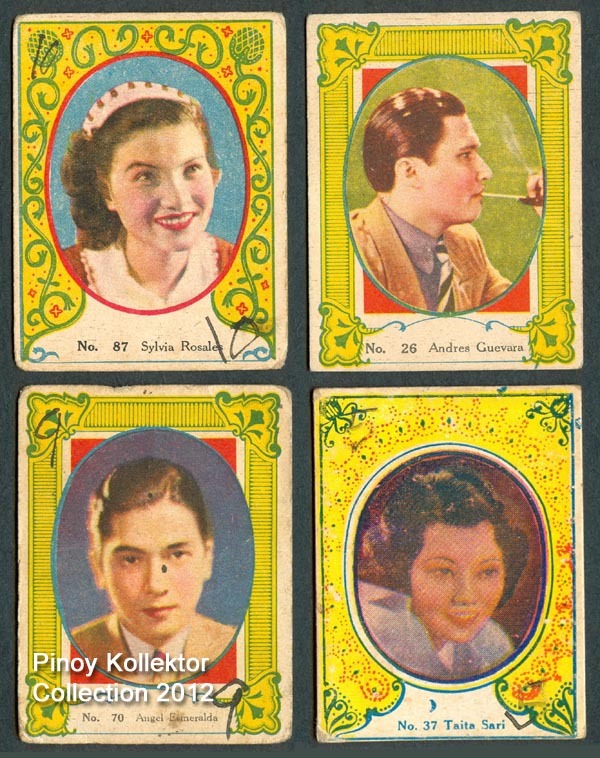 Among the popular Filipino actors during the early 1930s were Mary Walter, Rosa del Rosario, Rosita Rivera, Rogelio dela Rosa, Rosa Aguirre, Silvia Rosales, Tia Duran, Carmen Rosales, Gregorio Fernandez, Rodolfo Ruiz, Leopoldo Salcedo, Ely Ramos, Fernando Poe Sr., Corazon Noble, Elsa Oria, Norma Blancaflor and Jose Padilla. There are also teks cards featuring American Hollywood stars during the same era. 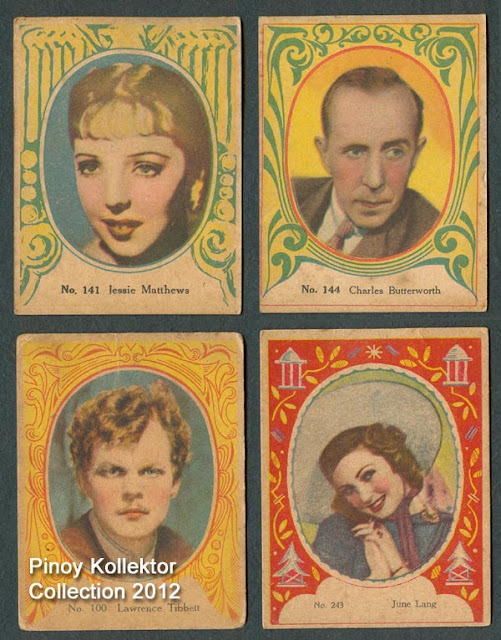 The 1930s decade (and most of the 1940s as well) has been nostalgically labeled "The Golden Age of Hollywood". 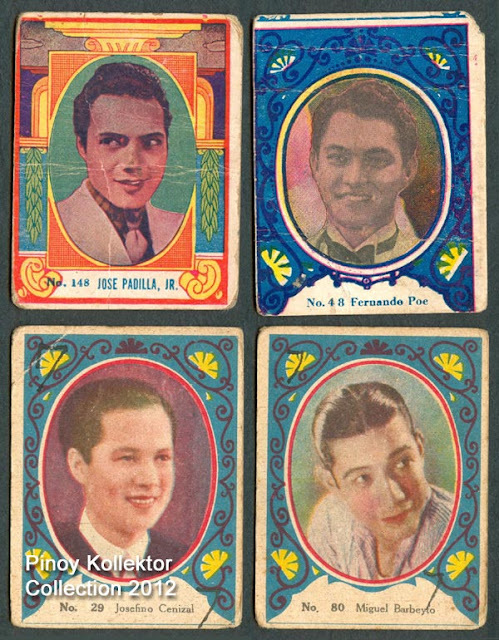 The cards were printed on cardboard like our teks during the 1960s. These 1930s teks cards are a bit bigger, twice the size of the 1960s cards, measuring 60 mm x 78 mm. They were played in a toss up manner similar to how we play the modern teks cards. 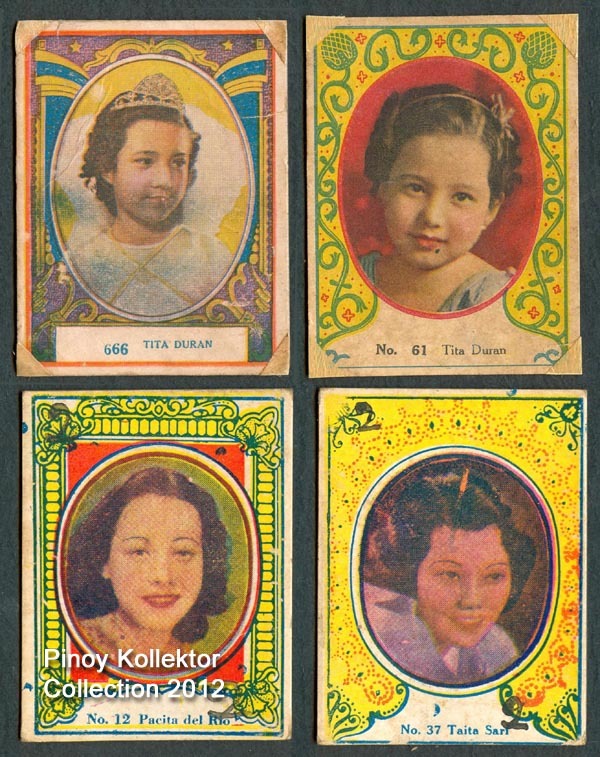 I hope you enjoy looking at this vintage teks cards. Domingo Principe, Fernando Poe, and Jose Padilla Jr.